Physics Buzz: Another Law of Physics Broken? The research team looked at the spectral signature of distant quasars using the Keck Telescope in Hawaii, and the Very Large Telescope in Chile. When light hits an atom, specific wavelengths are absorbed by the atom’s electrons. These missing wavelengths can be seen as dark lines when the light is broken up into the color spectrum by a prism. Different kinds of atoms absorb different wavelengths of light, so this serves as a sort of cosmic fingerprint of what a distant object is made of. The researchers found these spectral lines were falling at different spots and in slightly different patterns along the spectrum than they ought to. The ions the team observed, including magnesium, nickel, chromium and zinc, seemed to be absorbing wavelengths of light they shouldn’t be. The researchers concluded that this indicated that a fundamental constant of the universe, the fine structure constant, might have changed over time. Usually denoted by the Greek letter alpha, the fine structure constant characterizes the strength of electromagnetism in the universe, one of the universe’s four fundamental interactions. “A change in alpha generates a very unique fingerprint in the pattern of absorption lines,” said John Webb at the University of New South Wales, and lead author of the recently published paper. Weirdly, the differences in the spectral lines weren’t consistent. Quasars in the northern hemisphere seemed to have a slightly smaller value for alpha, while those in the northern southern hemisphere tended to have a slightly higher value. “We found that it looks as if one of the laws of physics seems to vary throughout the universe,” Webb said. The claim is dramatic, and could potentially have far reaching impacts. In their conclusion, the researchers say that this could be evidence for multiple universes because these results could “infer a very large or infinite universe, within which our 'local' Hubble volume represents a tiny fraction, with correspondingly small variations in the physical constants.” Members of the team have also said it might hint as to why the laws of the universe seems so perfectly tuned to support life. “The answer may be that other regions of the universe are not quite so favorable for life as we know it, and that the laws of physics we measure in our part of the universe are merely ‘local by-laws', in which case it is no particular surprise to find life here,” Webb said in a press release. However this conclusion has been controversial among scientists. Constants are supposed to be just that, constant and unchanging. These results fly in the face of the long established equivalence principle, which holds that the laws of physics are constant at all points in the universe. A preprint of the research was published about a year ago in the open-source online archive the ArXiv and caused a bit of a flurry in the press. Now that the paper has been published in a peer reviewed journal, the paper has taken on a more respected status, however doubt remains. Chad Orzel, a professor of physics at Union College was skeptical of the conclusions when it was first posted last August. After seeing the updated version he said he remains unconvinced. David Schlegel, an astrophysicist at Berkeley National Laboratory who looks at spectra of quasars echoed Orzel’s sentiment that if the results aren’t confirmed by other sources, the error is probably buried somewhere in how the telescopes work. “[M]y most immediate concern is whether we have an instrument that is well-enough understood that we would believe the results. [Physicist Kim Griest’s team at UCSD] did a careful study of one of the instruments used, and found a number of problems that they neither understood nor could adequately correct for. This latest Webb et al paper attempts to ‘calibrate out’ these problems. But these instruments should be predictable systems, and I wouldn't trust results based upon calibrating out systematic errors that are not understood. Indeed, the Griest paper shows that different choices of how to do so results in different answers,” Schlegel said in an email. The Greist paper is referenced in The Webb paper; however it says that the effects observed by Greist do not apply. Schlegel added also he was not criticizing the quality of the science done by Webb and his team, as they were reporting what they observed, but felt that it was more likely going to turn out that some other effect was causing the apparent changes in alpha. Webb recently completed another, much longer paper with more detail about the methods used. He submitted the 40-page paper to the journal The Monthly Notices of the Royal Astronomical Society; however it has yet to be published. He said that it is always possible that further scrutiny of the research could show a previously unnoticed error or other effect that could throw off the results. Already Webb’s team is looking for ways to collect more evidence. 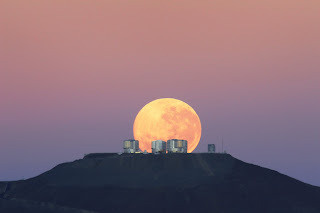 In the future Webb said he hopes to use the ALMA radio telescope in Chile to check their results by listening for out of the ordinary radio signals. In the meantime, in one of the labs at the University of New South Wales Webb has set up a project for 18 undergraduate students to sift through existing Keck data and look for other evidence of unusual spectral lines. Sean Carroll of Caltech said that if the spectral readings are confirmed, the implications could potentially be huge, but doesn’t think that there’s enough evidence yet to definitively say the culprit is a changing fine structure constant. He described the fine structure constant as akin to an unchanging field throughout the universe, and any changes in it would take energy. Noticed the same text - should one of the hemispheres be..."southern" ...? smaller or higher. Why not smaller or larger, or lower or higher. Thanks, good catch on the typo. Fixed! If there's not enough energy to create a variation in the field from a smooth start then maybe the reverse is also true: initial variation is frozen in because there's not enough energy and/or passed time to have smoothed it out yet? Intriguing idea. Reminds me of the world in Fire Upon the Deep where different parts of the universe have different laws of physics. Some of the greatest leaps in science have emerged from findings that contradict current understanding. Maybe this is not one of them, but I remain hopeful that we get another nudge in the right direction sometime soon. But wouldn't slight changes in the laws of Physics preclude the development of life? How different can the laws of Physics be and still allow life to exist? That's exactly right, different laws of physics in other parts of the universe would indeed likely not allow life to exist elsewhere in the universe. Webb is saying that the reason life exists here, is because for whatever reason, this part of the universe has the right physics to let life exist. If other parts of the universe don't have the same laws of physics, maybe gravity is too strong or too weak, or something to that effect, life couldn't exist there, making the universe where we live pretty special. The very same plot shows that measurements with *each telescope independently* show some evidence for dipole variation, and that the directions of these dipoles are consistent between the two sets of observations. These are the green and blue smudges on the diagram. 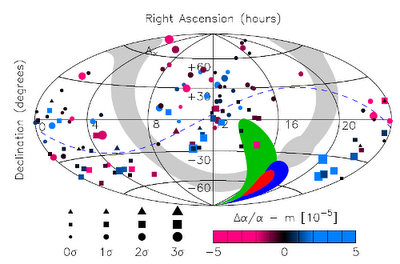 The red smudge is the smaller error region when all the observations are combined. It could have been that the two independent sets of observations gave inconsistent dipole directions, but in fact they don't. Chad Orzel either didn't notice, didn't understand, or didn't want to mention this fact. Surely as physics bloggers you're aware that the fine structure constant contains the speed of light, so a change in one implies a change in the other, right? Let's see Orzel brush all of that under the carpet. A law without enforcement is merely a recommendation and a law without a law maker does not exist. So if these "laws" were around before humans, who then is the law giver and the enforcer? Calling these things laws flies in the face of everything atheists claim to believe in. Aside from this though, we puny humans should not be so bold as to project our observations from our tiny corner of the universe onto the universe as a whole. When we do this, we make many assumptions about the accuracy of our understanding of how things work on a universal scale. We did not build it or make the laws, nor do we enforce them. Perhaps this is a glimpse of how things work across the way..? Wasn't this predicted by Heim Theory? You seem to be misconstruing what we mean by 'law'. A law in science is something we discover that seems to hold universally. No one has to enforce the law of gravity, for example - we simply discovered it. We could call them anything, let's say 'Bob' instead of 'law', if you like. As far as we can tell, the Bob of gravity seems to hold wherever we check. It seems reasonable to me to assume it holds everywhere we haven't checked as well. Of course, if we find that gravity is different somewhere, it means we have discovered that it's no longer a universal Bob. The fine structure value seems to be constant in our part of the universe, and is an important part of various Bobs that we have discovered. That's why this work is so interesting - some physical Bobs may turn out not to be Bobs at all, in distant places (should we call them Steves instead). In this case, the chances are Bob is indeed Bob, but only looks like Steve through a telescope. I read that the neutrino thing was solved. Apparently they ironically forgot to take into account the theory of relativity with respect to the satellite timing the neutrinos. That is a solution that one person postulated. It has not yet been checked. Bob, I'm honored that you stopped by! At least is wasn't Steve . . . I know that alpha is a constant, because I returned to 137 LeConte every day for 5 years and always found my lab there. Furthermore, I'm suspicious whenever anyone says "perfectly tuned to support life." Usually when I get the pleasure of reading more about what they mean, I discover they mean the opposite. It's not perfectly tuned, it's quite marginally tuned. If it were perfectly tuned, then small changes in anything wouldn't change the outcome. If you don't believe this, then you don't agree with me on the meaning of perfectly. That's my point. Perfectly is not a term with any scientific meaning. Have you ever tuned a guitar? If every string was tuned to the correct frequency of the note(s) it is meant for, one may accurately say "it's perfectly tuned". How difficult is it to affect the tuning? a mild pull on a string, or a small twist of the knob is sufficient to render the tuning worthless. Yes, small changes DO change the outcome of a perfectly tuned system. The problem comes in where "Tuned to support life" implies an action performed to accomplish a purpose, as does "tuned to play music" which would require a tuning agent - the activity of an intelligent being (ever see a rock tune a guitar?) which is untenable to many who count themselves atheist. As for your "knowing" that alpha is constant - you can only know it as far as it affects you - if it not constant in parts of the universe that dont affect you, you would not know it. If that was the case, what does it matter? Might be interesting, but it wont affect 137 LeConte.